The European wholesale power markets are developing quickly, with liquidity growing across the continent. Power professionals in this rapidly moving market need access to independent and reliable information to help them make decisions faster and to the highest possible standard. At ICIS, we provide expert coverage of the power markets in Europe, supplying our customers with the latest over-the-counter price assessments, news, monthly analysis and unrivalled information on the European renewable energy markets, as well as forecasts and forward looking analytics propositions for Germany. Our new and unique hourly PFC will give you an outlook on prices adjusted for the continuously changing generation landscape. Our comprehensive range of in-depth power price reports are provided by our specialist team of experts, supplying information on established power markets in western and central Europe, as well as the emerging markets of eastern Europe and the Balkans. Countries covered include the UK, Germany, France, Turkey, Bulgaria, Serbia and others. Our team of analysts focuses on analytical propositions including a day-ahead to day 6 forecast for the German market and a forward looking Hourly Price Forward Curve. Power Perspective is an online tool designed to put power market developments into perspective regarding their price impact. Our experts analyse the cross-border impact of national developments and provide you with a roadmap of market drivers throughout Europe. This empowers you to develop the most profitable strategy for your business. Highly accurate price forecasts and HPFCs for all trading horizons on the German power market – Intraday, day-ahead and long term. The ICIS price forecasts combine a range of modelling techniques, including regression and neural network approaches, to accurately forecast prices in all situations. ICIS forecasts for national demand deliver highest accuracy by processing an unusually high number of input variables without overfitting, including highest resolution weather data. The ICIS Power Index (IPI) gives homes and businesses an insight into price trends on the UK wholesale electricity market. Robust energy markets are vital to the UK economy, and the IPI makes electricity price trends and activity more visible and accessible to household consumers and commercial buyers, as well as media and policy-makers. The ICIS intra-day forecast is extremely accurate and even simple hypothetical trading strategies enabled high trading profits last year. 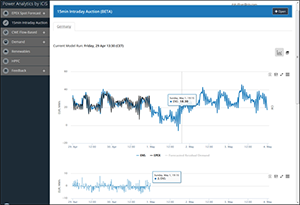 See the benefits for yourself with a free, two-month trial to the ICIS intra-day auction forecast and access three daily forecast runs. Supply will pick up quarter on quarter however as winter consumption, which must be met minute by minute, ramps up. The impact of coal prices in particular could lift the overall price of electricity because coal-fired power, although on the way to being phased out in Europe, is still vital for meeting high demand over the winter months. As is always the case, demand will be key to system security over the winter. The timing of any cold snap – whether it hits Europe before or after the New Year, or sometimes on either side – can influence how comfortable the electricity system is when coping. An earlier cold snap can cause issues if followed by another later in the season. Specifically, the IPI shows the average daily price for electricity delivered over the next summer and winter in pounds per megawatt hours (£/MWh), weighted to show the extra demand for electricity in winter.